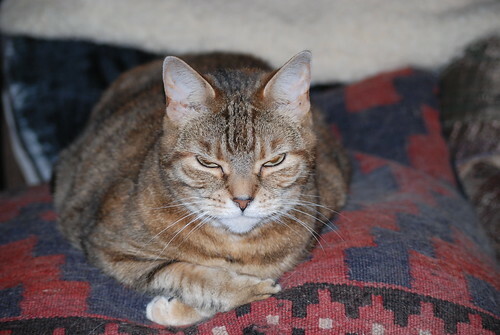 We lost one of the Putney mogs at the weekend. Not the Jeffster, who's recovered remarkably well from his amputation. Instead it was a sudden and surprising loss, as Calli the little yellow cat was found dead by our downstairs neighbour who was cat sitting. I'd only been away less than 24 hours. We're completely shocked, and terribly sad. Calli had been rescued as a semi-feral kitten back in 1998. She was very affectionate, and followed us around the house, protesting with her high pitched mew if she saw us leaving the safety of the house. She'd done outside, and inside was so much nicer. We're going to miss our little yellow shadow, who followed us from room to room, making sure her humans never got too far away. Here's the last photograph I took of her. That's very sad. My sympathies. ...and when you had to go away and it all happens on the other side of the world. awwww - I'm so sorry. I have a missing cat right now, the last time I saw her she didn't look good at all. I'm somewhat resigned to the possibility that she went somewhere to die. It is disconcerting. That's awful news to get while you're away. My condolences to you. what a horrible thing to happen. Crap. Any idea what happened? That's so sad. It's horrible whatever the circumstances and sympathies to you both. Poor thing. You have my sympathies. I'm so sorry, guys. I guess her work here was done. They never stay around long enough, do they. so sorry to read this -- she was such a sweet and companionable cat.